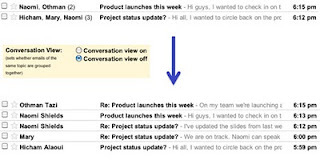 Gmail blog wrote today about the rolling out a new feature over the next few days pertaining to conversation threads (emails of the same topic are grouped together). 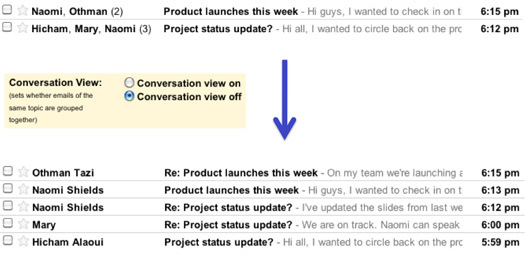 You can now choose to receive your Gmail with or without conversation threads. For those of you who find the conversation threads annoying simply go to “Settings”, look for the “Conversation View” section, select “Conversation view off” and save the changes. This action will allow you to have individual emails each time even if they pertain to the same topic. If you decide you would like to receive your mail with conversation threads again, simply reverse the aforementioned actions. Below are examples of mail with and without conversation threads taken from Gmail Blog. You can follow this blog via the "Follow with Google Friend Connect" Link on the right, add http://www.webbytesblog.com/ to your RSS feed or Google Reader.